What about going to a place where you felt God and knew they had… IT? They didn’t have the stuff that most people think we need to have a church. Every week people came to know God and invited their friends because they didn’t have the stuff they thought they needed… they had what they needed… The Spir-IT! Laser Focus – most people today said more ministries/events is better. I believe better ministries is better. Jim Collins asked, “what can you be the very best at?” In order to reach people that no one is reaching, you’ll have to do things that no one else is doing. But to do things that no one else is doing, you can’t do what everyone else is doing! Planned abandonment! Cut all but 5 things. Worship, Small groups, kids ministry, student ministry, missions. What are you doing that you need to STOP doing. You have everything that you need to do all that God wants you to do. What if I said you need to raise 100,000 dollars by Friday? Couldn’t do it. What if I said you have to raise 100,000 for a shot for child otherwise they will die? YEP! Overcome the obstacle! He often provides where God doesn’t provide. They had to see something they couldn’t see. What is God trying to show you through your greatest limitation? Peter couldn’t have done what he did if he hadn’t failed! He failed walking on water, he failed by denying Him, but he succeeded feeding his sheep! 3,000 were saved! There are two steps to failure. The Mule – shook of the dirt, the dirt started piling up at his feet and he started stepping up. SHAKE IT OFF! STEP IT UP! What has God called you to do that you are afraid to attempt? When are you going to do it? They are led by people who have IT! You need to have IT for your ministry to have IT! I tried to be Rick Warren – but I’m accidental. I tried to be Joel Osteen – but I’m not that happy! God showed me I had became a full time pastor and a part time follower of Christ! DANG! I stopped reading other books, and started just reading the Bible. I went to another country and held a baby that would probably die after I left. I started fasting again! Let God break your heart again! If you read this say a prayer for Mike. A guy Craig has been ministering to for 4 years and still hasn’t accepted Christ! If you don’t have it what are you going to do to get it? WOW! 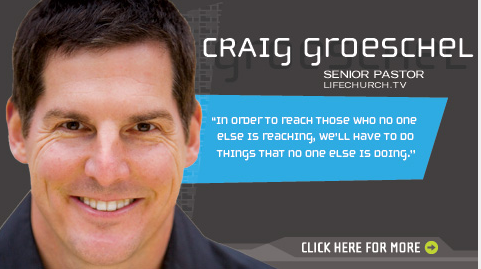 Go here and buy his message if you are a church leader. It should be up here later.